Without further ado, here comes the third installment in my analysis of World War Hulk, fresh from my gourd and into yours. Just a note: solicitations for February-shipping Marvel Comics products were just posted yesterday, and they include some goodies. Still no word on the WWH hardcover edition, which should be out in time for the feature film (and it has, FYI, been removed from the amazon.com listings). Similarly, there's nothing to report on the Essential Rampaging Hulk trade paperback volume, which has been rumored since early this year and is reported to collect over half of the Doug Moench-written tales from the B&W/Marvelcolor magazine from the late 1970s. But there is word on something unexpected: The Incredible Hulk Omnibus, Volume 1, collecting all of the 1960s Hulk fun from The Incredible Hulk v.1 #1-6, Tales To Astonish #59-101, and The Incredible Hulk v.2 #102. Clocking in at 752 pages, in hardcover, with oversized pages, this volume promises a fully remastered look at these classics, plus all original pin-ups, letters pages, and even some unused bonus material, the original introductions from the three Marvel Masterworks hardcovers starring the Hulk, and some extra articles and criticisms. All this can be yours behind your choice of the original Jack Kirby Hulk #1 cover, a super-cool Alex Ross painting of same, or an ultra-mysterious "movie variant" which I'm guessing features a rendition of the Hulk on its cover from the new 2008 film, The Incredible Hulk. Any way you go, you can't lose with this offbeat collection, which will feat neatly just to the left of your copy of Planet Hulk. Released a mere two weeks after the previous issue, some faulted the story in this issue for being rushed. From my view, it was anything but, at least content-wise. Considering the delay involved in the final issue, perhaps it would have been better to delay this book and #4 a bit to better space the storyline out. Then again, maybe they didn't know #5 would run as late as it did: artist John Romita Jr. is generally one of the more reliable in Marvel's stable in terms of meeting deadlines. The storytelling shifts in this issue to a more personal level, continuing the transition that started last issue with the arrival of Rick Jones. Two more individuals from the Hulk's past, and reflections on that past, highlight this story and drag the series away from the "Marvel Vs. the Hulk"-edness of the first two stories, extending the arc into a magnum opus for the Hulk (linked with "Planet Hulk" obviously) and perhaps the apex of his entire 45-year career. (Don't think that the 1962-2007 anniversary was ever lost on me.) I'll address both characters in context, along with a healthy dose of Hulk history. Along with Rick Jones, no member of the Hulk's supporting cast has been around longer than General Thaddeus E. "Thunderbolt" Ross. His dead (or maybe not) daughter Betty had been the longtime love interest of Bruce Banner (and to a more limited extent, the Hulk). His relationship with Banner and his alter-ego is one of the truer, more real relationships of the Hulk's storied history. He hated the Hulk because of the threat he was to the world at large, but at the same time his daughter loved the man who became the Hulk. He was torn between duty to his country and that desire to see his daughter happy. His was the best development from the revelation, all the way back in Tales To Astonish #77, that Banner and the Hulk were one and the same. He tried setting Betty up with Major Glenn Talbot, and that even succeeded to a point, but it seemed nothing could keep her from Bruce. Many years and many teams of Hulkbusters later, General Ross received word of Talbot's death (by his own hand in battle with the Hulk--see Hulk v.2 #260), and shortly thereafter, Banner gained full control of the Hulk's body (Hulk v.2 #272), becoming a "true" force for good and even receiving a Presidential pardon or past misdeeds (Hulk v.2 #279). A rift formed between Bruce and Betty then, as Betty wanted Bruce to use his control over the beast within to leave that part of his life behind. Perhaps as direct result of his daughter being spurned, Ross colluded with the enemy (in this case M.O.D.O.K. and the Abomination) to attempt to destroy the Hulk one final time, in Hulk #288-290. He was branded a traitor to his country and dishonorably discharged. He nearly killed himself (in #291), and next showed up, washed up, at Bruce and Betty's wedding. He shot Rick and then Betty took him down a few pegs when she finally confronted him. Thunderbolt stayed around the base, inadvertently causing Rick to change into a Hulk, even picking up the powers of Zzzax (no, really!) when nobody could figure out what to do with him. Then he died...and later was reanimated, first by the Leader's stooge, Soul Man (c. Hulk #400), and later by the Troyjan, Armageddon (c. Hulk #455), using the Leader's equipment. Ross then became a staunch supporter of Banner, bringing him and the Hulk on board to serve Uncle Sam, but then his daughter Betty's death put a premature end to that. He went on a tear against the Abomination, his daughter's "real" killer, even later manipulating Banner into becoming the childlike incarnation of the Hulk to exact revenge. He and Banner have seen each other infrequently since then, most recently in a retcon of the Hulk's first meeting with the Abomination (Hulk: Destruction #1-4), where the military applications of a being with Hulk-like strength and healing were brought up quite strongly. And now, well, everything's come full circle, as ol' Thunderbolt realizes "the way things are"--that every time Banner seems to have things well in hand, they fall apart and the Hulk goes on a worse tear than the time before. He's lost his daughter to the Hulk, and he's not going to lose any more. The irony is not lost on him that it's those same heroes who lobbied for and congratulated him on his pardons who are now the targets of his rage, that they're reaping what they have sown for enabling him to go on existing. So yes, Ross' inclusion is a natural and necessary fit here, not just because of his ties to the Hulk's past, but also the parallels between his losing Betty and the Hulk's losing Caiera. And that begs the question: is Ross too blinded by grief to see the real picture? Nevermind that Betty may be alive--it's not necessary and in fact irrelevant to believe any differently during WWH. Has he let grief over his daughter's death fester and grow into something truly ugly, or is Pak conveniently reverting Ross to type for the purposes of a mindless struggle? It's the former, I think, and that point has its own parallels to the Hulk's current rampage. Is the Hulk too blinded by his loss of Caiera to see the full picture? Circles and cycles, circles and cycles. So, General Ross orders his army to shoot the Hulk full of adamantium shards. Being the hardest material available, of course they tear through the Green Goliath's skin, making him angry. However, they also break his concentration, and leave him vulnerable to Dr. Strange's psychic attempts to liberate Bruce Banner from deep inside. Or maybe not so deep? Dr. Strange represents another side to the Hulk, being, perhaps, both Banner's and the Hulk's closest super-powered friend. They say a friend knows your deepest, darkest secrets and loves you anyway, and that's certainly true between Dr. Robert Bruce Banner and Dr. Stephen Strange. Strange met the Hulk when the goliath rescued him from a hell dimension, giving him a fleeting reprieve from his responsibilities as Sorcerer Supreme (Hulk #126). Months later, Strange again assumed the mantle, and soon afterward formed the on-again, off-again "non-team" called the Defenders, the first issue of which (Marvel Feature v.1 #1, actually) established the Hulk's psychic aptitudes (he could see astral forms!). Banner could count on Strange to soothe the beast and keep him in line during adventures. Still, that didn't stop Strange from doing what needed to be done, allegedly--namely exiling the Hulk to an interdimensional crossroads when Banner committed psychic suicide after Strange's foe Nightmare loosed the beast from Banner's subconscious after months of dormancy (whew! see Hulk #297-300). The Bannerless Hulk was ensorceled and sent to a myriad of worlds where he could "neither harm nor be harmed," a failsafe spell being triggered every time the Hulk became disenchanted with his current choice of world, returning him to the Crossroads to choose anew. The bestial Hulk eventually regained Banner's rational mind and returned to Earth with help from the Beyonder and Alpha Flight, but nobody ever did follow up on what the Hulk and Banner thought of Strange for banishing him in the first place. The closest was when the gray-skinned Hulk re-teamed with Strange and Namor for a semi-Defenders reunion (Hulk #370-371), where a throwaway line pretty much eliminated any tension. Strange helped Banner find Betty, and later still they re-teamed the Defenders even more. How, then, did Strange believe it was again time to banish the Hulk, his friend? Did he honestly think that Banner's fractured psyche could magically (ha) forgive and forget again as he'd obviously done before? Could he believe anything could be 100% foolproof? The Crossroads was intended to be a permanent solution then, too. Truly we can ask: What the hell was Dr. Strange thinking when he agreed to this? When Strange enters the Hulk's mind, he sees a landscape he does not recognize. The Hulk asks him where they are, but to we readers (and to the Hulk himself!) the locale should be obvious: it's the planet Sakaar, where Hulk had his most traumatic fall. While Korg and Hiroim protect his body from Ross' weapons, the Hulk has his most important confrontation yet with an element of his past. "Show me your true face," Strange intones, and the Hulk laments, "That's what she said," she being his queen, Caiera. And thence we see, for the first time in the course of World War Hulk, Bruce Banner. Here's where my beef with the lack of expository monologues really comes through. We see Banner tell about his views on Sakaar and of the Hulk's queen. We see his genuine emotion at the reenactment of his--and the Hulk's--loss. But what we don't get is the in-depth answer we require, what would make this scene work all the more effectively (IMO). We get that he's disturbed at the Hulk's having lost a love, but we don't get why. I got more out of online interviews with Greg Pak and Mark Paniccia than I did this scene in the book. Banner tells a bit of his side, Strange says he went along with the others' plan to send him off-world, he denies planting any bomb, and tries to calm Bruce, who instead shows his true allegiance when he changes once more into the Hulk and breaks Strange's hands on the psychic plane, which has the unfortunate side-effect of breaking them in the real world. (Again, big irony here, in that the whole raison d'etre for Dr. Strange comes down to his wanting to repair his hands, which had been damaged in an automobile accident. Banner/Hulk have seemed to tap into this primal fear of Strange's. Kudos again, Greg.) Why not spell it out, that Banner finally saw the Hulk doing some real good without having to worry, that he was thriving on a world where his strength was a real asset, that the Hulk was actually building a nation, falling in love, developing real human attributes, admirable ones at that, becoming a hero on his own terms, and that the goddamn ship explosion took all that away from him/them? Maybe it would have taken some shock out of the scene, but as-is, it all just reads as a "Reader's Digest" version and doesn't have the emotional "punch" it should. It takes some reading into the text to get what really needed to be brought home and wasn't. Anyways, the Hulk returns from his assault on Strange on the astral plane, and of course, he smashes up the military but good. (There's the question of whether Korg and Hiroim actually witnessed a physical metamorphosis of Hulk to Banner and back again during the time when he was pulled into the astral plane, and a "yes" would go a long way toward explaining events in #5. Hiroim's "He's back" comment seems to contribute to the affirmative. Make of this what you will.) 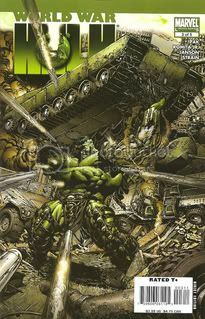 The ensuing battle sees the trademark tropes of the Hulk-vs.-army fights of the past, particularly Hulk's devastating thunderclap sending shockwaves through the ranks. The Hulk and Ross take a tumble out of a helicopter and we can guess Hulk wins. Of course, the scene isn't complete without yet another shot of the Sentry, still too terrified of his own power to leave his Vermont home (diagnosed herein as an "agoraphobic schizophrenic," which points him, bang-zoom, squarely toward a Hulk parallel of his own). The Hulk and his warbound tear up the Madison Square Garden to echo the gladiatorial arenas of Sakaar, with Hulk himself echoing what Miek has regurgitated since Hulk said it first: "Never stop making them pay." Finally, sorcerer meets sorcerer as Hiroim and Elloe invade Strange's Sanctum Sanctorum, adding Iron Fist, Ronin, and Echo to those enslaved by the Red King's obedience disks. Strange is shaken by his friend's astral ambush: his hands crippled, he resorts to unorthodox means of striking back. What he comes up with is a potion kept under lock and key in the Sanctum--one that contains the essence of the demon Zom, who once nearly destroyed the entire world and necessitated the intervention of the Living Tribunal (Strange Tales #156-157...look it up). That Strange would stoop to these depths is unsurprising when considering the close historic relationship between Banner/Hulk and the good Doctor, plus the nature of the injuries and their drudging up all of his insecurities tied into his very origins as Master of the Mystic Arts. He's human. He overreacts. And the result is his horrifying possession by a demon that could destroy everything--another threat for the Hulk, and his strongest obstacle yet. This third act of WWH, as stated before, continues the shift away from the broader battles to a more personal battlefield. It only gets bigger from here, but so far, beyond the little nuggets for older fans, I'm seeing a great deal of parallels that I'll get to by the end of this little reviewing session. Let's just say there are three groups to analyze. It seems Greg really had some themes going under the surface, and all but a few I've already touched upon. More next time on the march to the big finale.